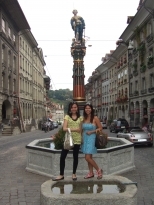 I was able to visit Bern for only a day. Yet, I had a grasp of this town. Its an easy going, relax place in a township way. For some cheaper eateries (because switzerland could be expensive), go to Markthalle. They have bread, swiss cheese, sandwiches of different sorts, drinks and a lot more snacks in a fast food style. You could eat it while standing or walking or by plastic tables. Do walk around town looking for their amusing fountains. Take picture with each. The task of looking for each fountain is like an Amazing Race. While at it, fall in love with the Aare River that goes all over Switzerland. Then look above and you would see the breathtaking Alps. This view will forever live your memories.